“Now they can [watch RT] without even leaving the premises of the United Nations… I think it is button 66… thank you for not making it 666,” the Russian envoy joked. 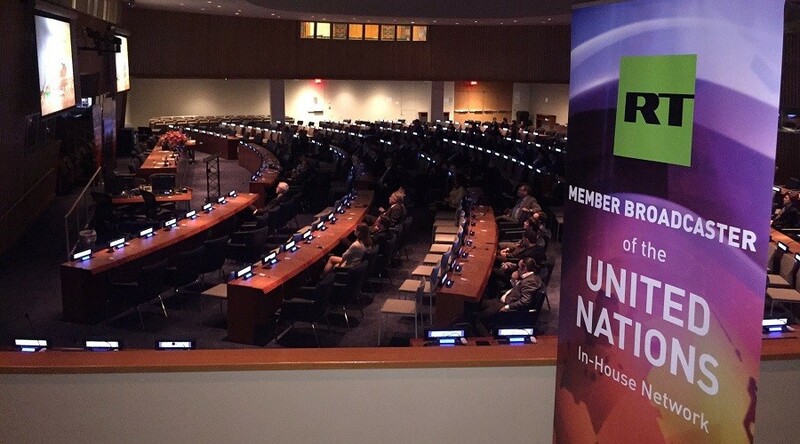 RT International TV channel became a part of the UN in-house broadcast on Tuesday, joining some of the world's major international channels broadcasting to UN officials. "Today, in the era of sweeping, global political changes, it is more important than ever to consider different points of view – to compare them, to draw independent conclusions," RT's Director General, Alexey Nikolov, who attended the agreement ceremony in New York, has said. While the channel is a "go-to source for alternative perspectives on current events" for millions of viewers around the globe, it's RT's "diversity of views and stories that... is the embodiment of the fundamental principles of the organization," he added. The UN network can be watched by staff members and delegates, as well as other officials visiting the iconic building, on desktop computers and on monitors in public spaces at the headquarters. "It is home to a diverse range of news broadcasting networks from around the world and in different languages," UN Under-Secretary-General Cristina Gallach said, welcoming RT's addition to the broadcast. “You will find yourself in a good company because we have many other news channels that broadcast in house and that help all of us that are here to understand better the different perspectives,” Gallach said. “In the current complex world the different perspectives, the different point of views, and the diversification of sources is quite critical,” the UN Under-Secretary added.